Ever wondered which programs get loaded every time you turn on your Mac? 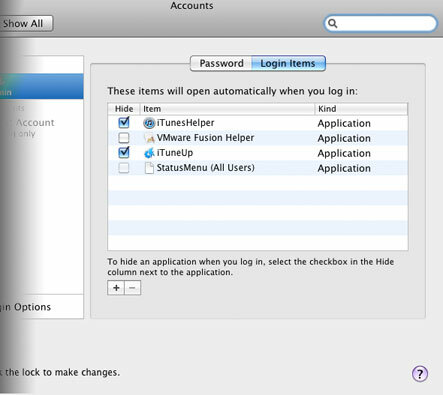 It's easy to see your login items by going to System Preferences (Applications -> System Preferences.app) then clicking on Accounts under the System heading. Once opened you can select "My Account" and click the "Login items" tab. To see a more comprehensive list of programs, including system services/daemons you can go to preferences in iTuneUp (hit [cmd] + [,] in the main screen or select preferences from the iTuneUp menuitem near the clock) and then click view under Startup items.